As a part of the acclaimed DC Comics - The New 52 event of September 2011, two high school students worlds apart, Jason Rusch and Ronnie Raymond, are drawn into a conspiracy of super-science that bonds them forever in a way they can't explain or control. As the two boys become caught in the cross hairs of an international special forces team with orders to capture or kill them, Ronnie and Jason seek to discover the secrets behind what has happened to them. What they find will shed light on the secret history of Firestorm! Many years ago, I remember picking up the very first issue of Firestorm: the Nuclear Man. It was created and written by Gerry Conway. Al Milgrom was the co-creator and artist. It quickly became a favorite of mine. In the original story, Firestorm was created by accident. This particular accident Professor Martin Stein and jock Ronnie Raymond were able to merge and form the super powered Firestorm. In the current version, Ronnie Raymond and Jason Rusch form the Nuclear Man. 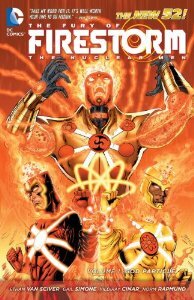 Firestorm is created due to the God Particle that was designed to create super powered beings to use as weapons. Ronnie and Jason have to learn how to put aside their differences and work together to defeat the forces that are trying to eliminate them. The art by Cinar does a good job of conveying the powers at work. His weakness is in drawing normal people. They tend to look okay at times and not as good at other times. The story by Simone and Van Sciver is a fun action epic. I miss the interaction of the older Professor with the teen aged student that Conway had in the original series. If you are looking for a deep Alan Moore/Grant Morrison type story, it is not here. If you like action filled summer blockbuster movies, I would recommend this comic book series. I will continue to read furture stories to see where the writers take it next.